Following the tragic death of her mother (played by Laura Dern) Cheryl Strayed (Reece Witherspoon) becomes consumed by her grief and begins to self destruct. She cheats on her husband and tries to loose herself in a downward spiral of drugs and alcohol. Facing rock bottom, Cheryl decides to make a change and try to become the daughter that her mother believed in - by hiking 1,100 miles alone along the Pacific Crest Trail. Having read (and loved) Wild the book, I was intrigued to see how director Jean Marc Vallee would adapt Cheryl Strayed's inspirational story. I was so pleased to find, therefore, that Wild the movie treats its subject with sensitivity and is an enjoyable companion to (but not a replacement for) the book. This is a moving and gripping film full of breathtaking scenery and powerful performances. Amid the stunning locations, Wild is unafraid to get gritty - raising the film above many other 'journey to find yourself' tales. Reece Witherspoon thoroughly deserved her Oscar nomination for her portrayal of Cheryl Strayed. She is superb in this challenging role. Meanwhile, Laura Dern is wonderful - her performance lingers long after the film has ended. 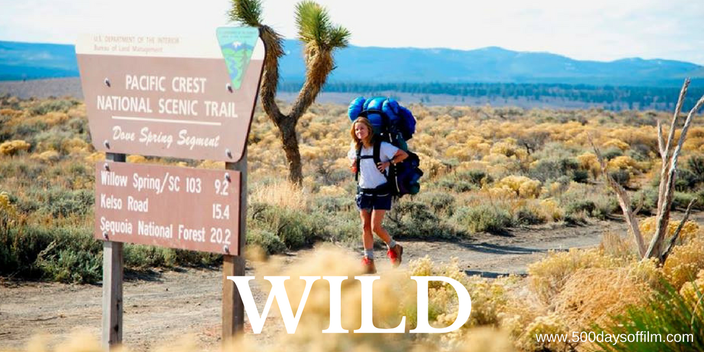 My only reservation about Wild (the movie) is that the full significance of parts of the film may be lost on an audience that has not read the book. For example, there is a scene in both the book and the film where Cheryl sees a fox. They stare at each other and then the fox turns and leaves. Cheryl cannot bear this loss (which we feel is linked to her mother's death) and she cries out for the animal to stay. In the book, this is an extremely moving event. However, in the film the fox looks odd and the encounter loses its impact. Reece Witherspoon formed a production company, Pacific Standard, to develop films with powerful roles for women. Wild was one of the films that her company championed. What did you think? Did you read the novel first? Let me know in the comments section below!